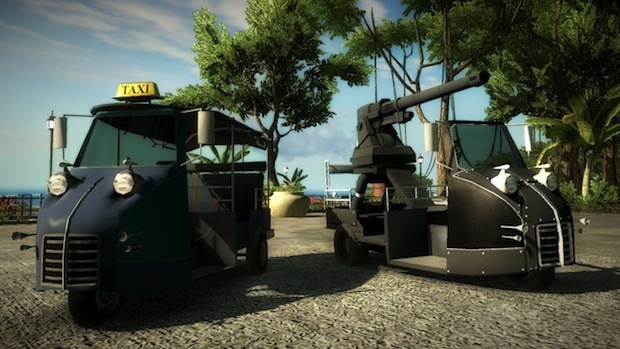 As a sort of "thank you" to the Just Cause 2 community/fanbase, free DLC has been released from the folks at Square Enix, and is available today on XBLA, PSN and Steam. It’s safe to say, there’s never been a ride quite like the Tuk Tuk Boom Boom. Pimped-out and pumped-up, this auto rickshaw rolls with style, grace and a roof-mounted weapon of mass destruction, capable of devastating even the most persistent of pursuers. Other features include heavily reinforced and multi-layered carbon fibre composite shielding, a polycarbonate laminated armour windscreen and quad front-mounted air horns. Um, quad front-mounted air horns? I like that better than the massive gun, as seen above. Also, in related JC2 DLC news, from today, players can also access all the downloadable items previously available only as pre-order promotional items.